Make your own salad dressing to avoid added sugar and other crazy ingredients! 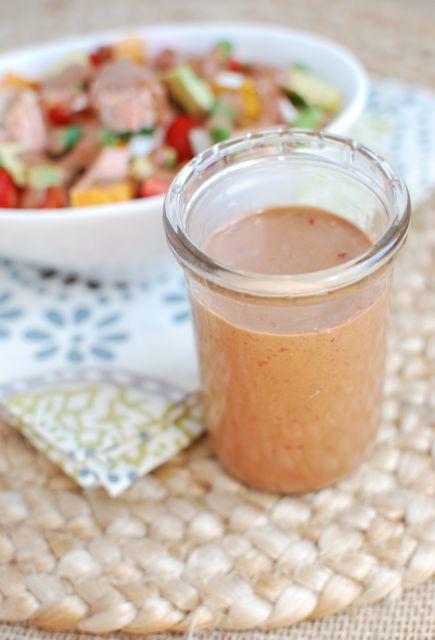 This Strawberry Balsamic Dressing pairs well with almost any salad toppings! This post is sponsored by Pompeian. I was compensated for my time. All thoughts and opinions are my own. So, as promised. I’m back to share a salad dressing recipe today! First, a few things to discuss. As noted above, this is a sponsored post. This year I’m excited to be teaming up with Pompeian to bring you some delicious new recipes. I’m a member of their Pompeian Pantry Insider program, so over the next few months you’ll see a few posts showcasing some of their products. Did you know that May is actually National Vinegar Month? It’s true. In honor of that, Pompeian asked us to create a spring or summer salad dressing using one of their vinegars. Right up my alley since I’m always looking or new dressings to put on my salads (both traditional and non-traditional). 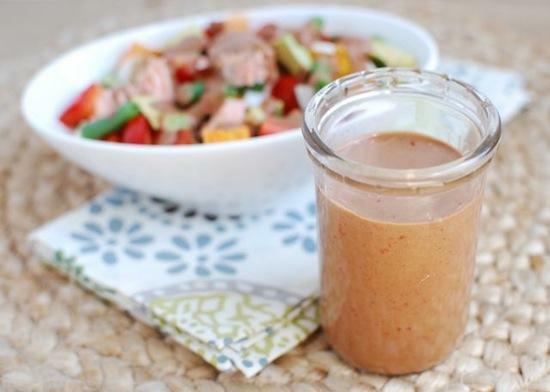 Ok, so for this dressing….I immediately knew I wanted to incorporate some fresh fruit into the dressing. Lately I’ve been on this kick of making avocado salad dressings, but I wanted to change things up. After considering all of the ingredients in my Salmon Chop Salad, I knew that fresh strawberries would be perfect. I almost included them in the salad itself, but decided it might be fun to put them in the dressing instead. I opted to use Pompeian’s traditional balsamic vinegar in this dressing, but the pomegranate infused balsamic would have been awesome as well. A fresh, light salad dressing that’s perfect for the warmer months! Some of the ingredient amounts are a bit variable because they will depend on your tastebuds. I’d start with 3 Tbsp vinegar and 1 tsp mustard and then add more after tasting if you want to. This dressing is light and refreshing. It would be great over a leafy green salad (especially one with spinach I think) or a non-traditional, lettuce-free salad. I love how you can see the little strawberry seeds floating around. So good! Heck, I might even pour some of this over grilled chicken and see how it tastes! Do you ever put fresh fruit in your dressings? YAY I have everything I need for this in my fridge and pantry right now. It’s meant to be 🙂 Also, I had no idea that there was a National Vinegar Month–all the more reason to stock up! Yum! I’ve never tried Pompeian balsamic vinegar before but I will look into it. This dressing looks yummy! sounds great! i typically just use balsamic but i love the sound of this! Love the fruity twist- I’ve had balsamic with fresh strawberries in a salad but not together! I’ve made a blueberry dressing that was amazing. I’m sure this one is incredible, too! it’s national vinegar month? who comes up with these? either way, i’ll celebrate with this! Now this is something I definitely need to try! I want to start making my own dressing because the ones you buy in the store are full of icky ingredients. I love how easy this one is and I can only imagine how fantastic it tastes! I have been making homemade dressing like crazy so this is the next one on the list! I want to start making my own salad dressing too, but I wish there was a way to keep it good for the whole week. Mine always seem to go bad after a couple days. When it’s just two people, we can’t seem to use it up quickly enough! yeah. it can be tough. making small batches of easy recipes is sometimes the way to go! With strawberries coming into season, I’d love to try this one! Thanks for sharing. This would make the perfect summer salad dressing! 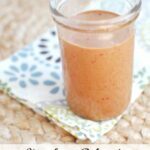 I love making my own dressings but have never tried a fruit based one. Thanks for sharing! 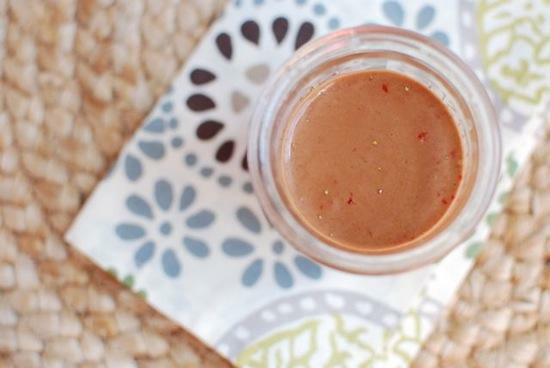 Love strawberries or any kind of berry in dressings and vinaigrettes! This one would definitely pair well with a spinach and chicken salad. Pinning it! Strawberry picking season starts in a few weeks and I’m definitely going to try this recipe. Love the rich color of the dressing. Looks delicious! This sounds delicious! I don’t think I’ve ever made my own salad dressing (but then again, I didn’t touch salad until about two years ago, so maybe that makes sense). I love salads with a fruity taste! This sounds delicious! How long do you think this would hold up in the refrigerator? Sounds delicious! You’re right- that would be good over chicken, probably even as a marinade. Perfect for summer! I’ve never put fruit in a salad dressing but that dressing looks delicious especially for summer salads so I think I will try. Looks good! I love homemade dressing vs store bought. I don’t usually make salad dressings – prob cuz I don’t usually eat salads – but with summer coming I think it’ll be fun to try. I love this, I am going to prepare it and use as a dressing on my ruccola salad the next time I am having one. I’ve never put fresh fruit in my salad dressing but this sounds delicious! Especially with summer right around the corner, this could be a big hit at picnics and brunches. I will definitely try this recipe tonight on some kale. 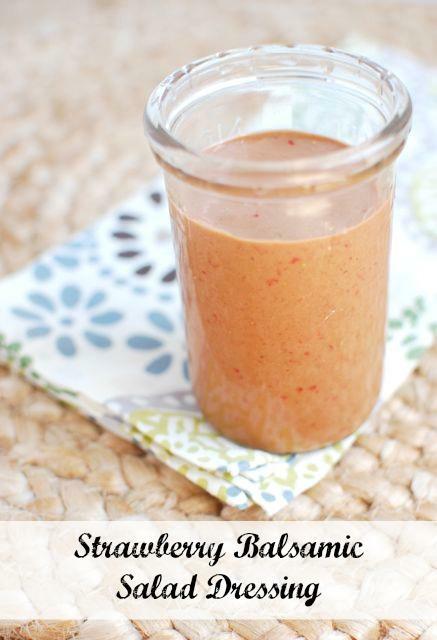 It looks delicious and a great way to get healthy fat from oil and natural sugar from fruit! [WORDPRESS HASHCASH] The comment’s server IP (198.57.247.226) doesn’t match the comment’s URL host IP (192.254.235.42) and so is spam. [WORDPRESS HASHCASH] The comment’s server IP (192.0.86.71) doesn’t match the comment’s URL host IP (66.155.11.238) and so is spam.